Once submitted, our specialists will review your document and will contact you to ensure the integrity of the submitted data. This form is secure, protected by SSL encryption, so your personal information is safe. ANY ADDITIONAL CHANGES APART FROM VESSEL NAME CHANGE OR HAILING PORT CHANGE WILL REQUIRE ADDITIONAL FEES. Insert name by which you wish the vessel to be known. Only standard Alpha and Numeric Characters in the vessel name will appear on the Certificate of Documentation. Click icon for attachment if application covers multiple vessels. Name, e-mail address, and telephone number of the owner to whom the Coast Guard should send correspondence and their Social Security Number (SSN) or Tax Identication Number (TIN). Only an owner or part owner can be the managing owner. For vessels owned by a corporation the corporation is the managing owner. For a trust arrangement, the trustee is the managing owner. For a Partnership or a LLC, the name of the Partnership or the LLC should be shown. All persons/entities (other than managing owner) who own an interest in the vessel. If no owners other than the managing owner, leave blank. Click icon for attachment if application covers multiple owners. IS THIS NUMBER THEIR SOCIAL SECURITY NUMBER OR THEIR TAX ID NUMBER? Check applicable blocks to show purpose of application. 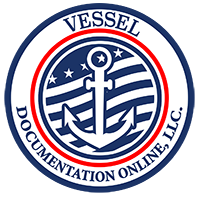 If vessel has never been documented, check Block #5 and provide ALL requested information known about the vessel's place and year of build, hull material, approximate length and previous names and numbers. If this information is unknown, please indicate. J. ENDORSEMENTS FOR WHICH APPLICATION IS MADE Check the appropriate block(s) to indicate all endorsement(s) sought on this application.